Along with his brothers Drogon and Rhaegal, Viserion was raised since birth by Daenerys Targaryen, however, after being fatally wounded, and then resurrected, Viserion has now fallen under the command of his new master, the Night King. Threezero is excited to announce the Daenerys Targaryen Sixth Scale Figure from Game of Thrones! This collectible figure stands approximately 10 inches tall and features her iconic platinum blonde hair with rooted fabric hair implantation, soft PVC dermis on the arms and torso, a well-fitted costume, and interchangeable hands for posing. Complete with an extremely detailed resin Drogon figure, Game of Thrones fans shouldn't wait on adding the Mother of Dragons to your collection! 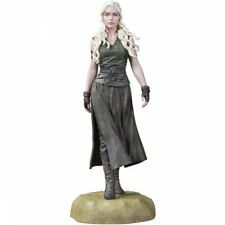 The Daenerys Targaryen Sixth Scale Collectible Figure features: ---Stands approximately 10. Game Of Thrones Viserion Ice Dragon Action Figure McFarlane Toys. Condition is New. Dispatched with Royal Mail Signed For® 2nd Class. 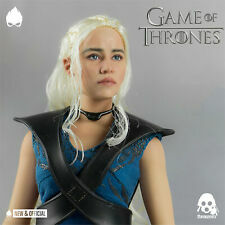 GAME OF THRONES DAENERYS TARGARYEN FIGURE by McFARLANE. THE DAENERYS FIGURE IS BRAND NEW , UNUSED , UNOPENED AND UNDAMAGED. Game of Thrones Robb Stark Boxed Action Figure HBO Dark Horse Mint condition. This item is in perfect collectable condition. Please check out my other game of thrones figures for sale. Message me if you have any questions. LORD SELWYN OF TARTH’S DAUGHTER, BRIENNE IS A HIGHBOURN LADY WHO TRAINED INSTEAD TO BE A WARRIOR. KNOWING THAT STANNIS WAS RESPONSIBLE FOR THE DEATH OF HIS BROTHER RENLY, WHOM SHE SERVED AND LOVED BRIENNE KILLED STANNIS. Viserion's wings span 16.5" wide and features up. his ice dragon form from the season 7 finale of. Excellent condition Funko Pop that is boxed and has never been opened. Game of Thrones Dark Horse deluxe Jorah Mormont Figure Boxed Mint Condition. Official dark horse collectable figure which is boxed and it Mint condition. Please check out my other game of thrones figures for sale. Message if you have any questions. 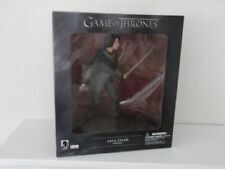 Collectible Game of Thrones - Figure - new and boxed and sealed. New Game of Thrones 9” Hodor and Bran Statue figure. Dark Horse Deluxe Official. Hodor has emerged as a fan favorite in Game of Thrones,carrying Bran Stark on his back. This special double figure measures some 9 inches so is an impressive piece . Sculpted and painted with painstaking detail, these figures capture the characters of the show with stunning realism. Truly a collectors piece. Item is brand new and the box has not been opened. We will respond within 48 hours. Material: PVC. Number 12 Edward Stark. Number 14 Tyrion Lannister. Number 15 White Walker. Jorah helped save Dany and her entourage from a sons of the harpy attack. He travels North with Daario in search of their queen, though secretly suffering from greyscale. Game Of Thrones Joffrey Baratheon Figure by Dark Horse Deluxe. Condition is New. Dispatched with Royal Mail 2nd Class. Year: 2015Packaging: Original (Unopened)Size: 8"
Her fate is still pending as season six of HBO’s series approaches. Condition is New. He brings the storm.”. – Jon Snow (about the Night King). Made of plastic. Features 12 points of articulation. Ideal for adding to any. Queen Daenerys Targaryen, is the younger sister of Rhaegar Targaryen and Viserys Targaryen and only daughter of King Aerys II Targaryen and Queen Rhaella Targaryen, who were both ousted from the Iron Throne during Robert Baratheon’s rebellion. Game of Thrones Robb Stark Boxed Action Figure HBO. Condition is New. Dispatched with Royal Mail 2nd Class. He brings the storm. Jon Snow (about the Night King). Made of plastic. Features 12 points of articulation.